In the fall of 2015 the body of Anne Arundel Community College chose to rename their athletics nickname "Riverhawks". 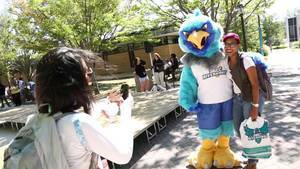 Keystone Mascots was chosen to bring to life Swoop, their new lively character. Oh, and he is quite lively! Swoop has been continuously lifting up the efforts of the collegians, garnering smiles and bringing more spirit to the campus. Swoop will be doubling his efforts this year thanks to his popular demand and Keystone Mascots' replication services. Cloning can be done!